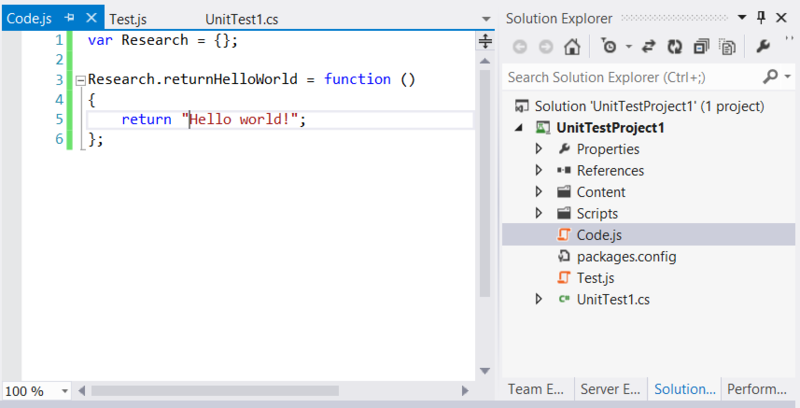 Home Posts tagged "Unit tests"
If you are using TDD in Microsoft Visual Studio 2010 and apply that red – green – refactor thingie, you want your tests to execute as fast as possible. 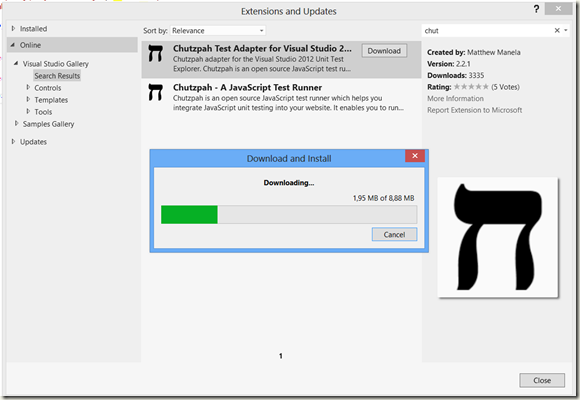 Well MSTEST in Microsoft Visual Studio 2010 is known to be a snail, so for TDD in Microsoft Visual Studio 2010 you probably want to use external tools like ReSharper, TestDriven.Net etc. 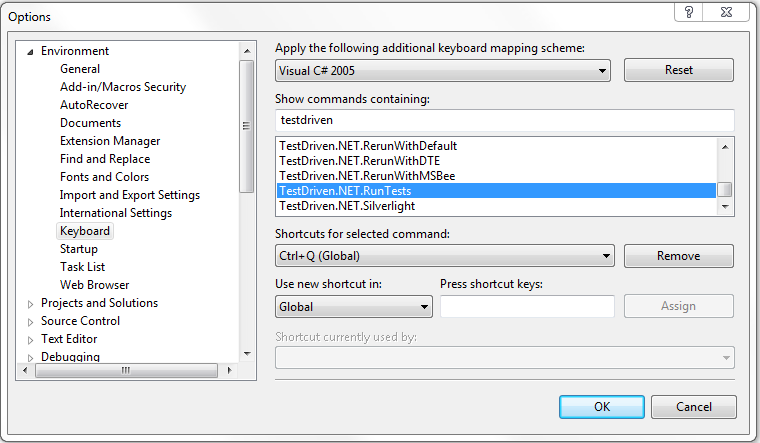 CTRL + Q to run the current test(s) in context without debugger. 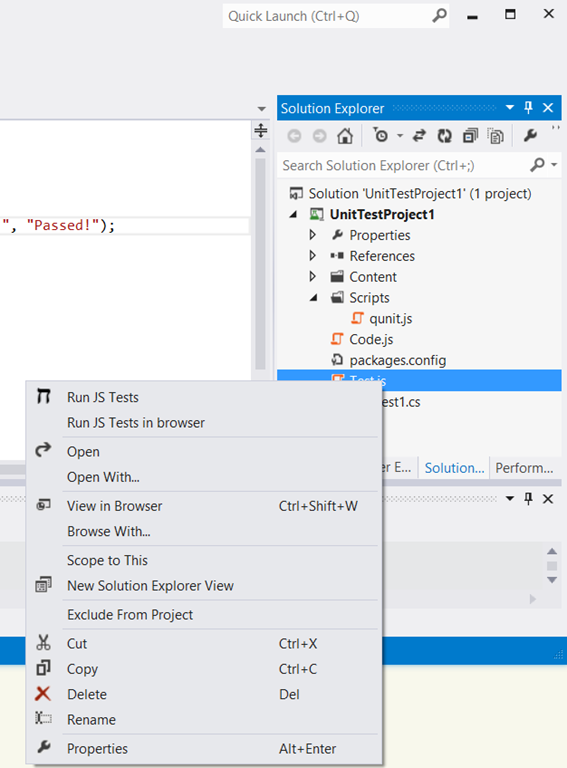 CTRL + W to run the current test(s) in context with debugger. 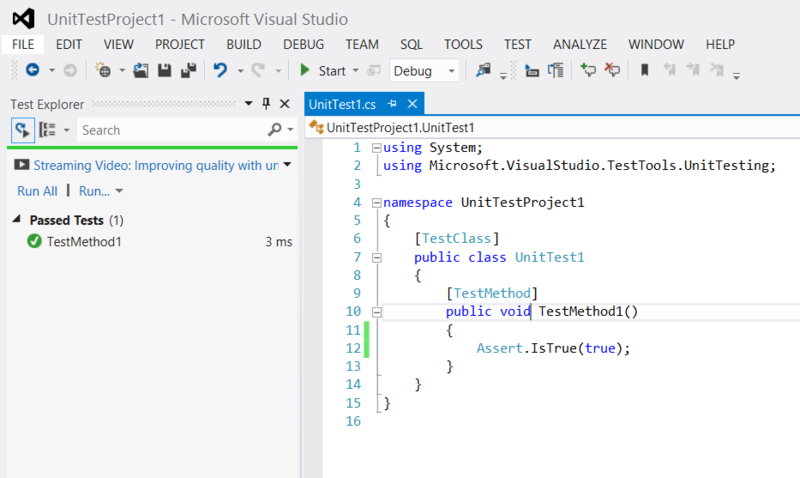 By the way, in Microsoft Visual Studio 2012 there is a tremendous performance improvement in running unit test, so you might want to look at that. 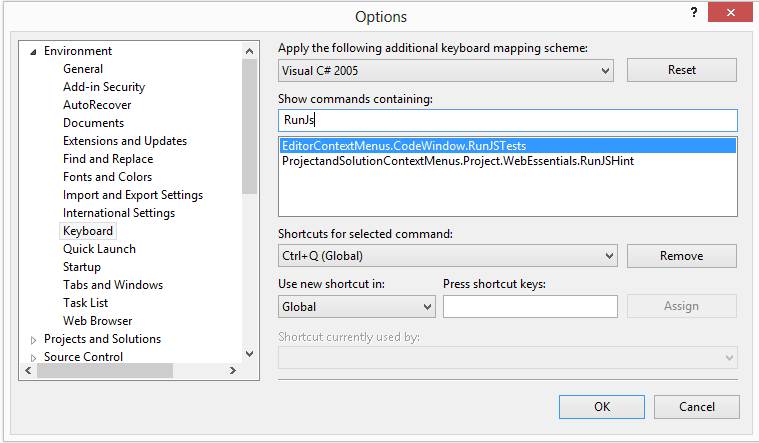 An other tip: don’t use CTRL + S (to save code), instead use CTRL + Q to save, compile and run tests on your code at once. 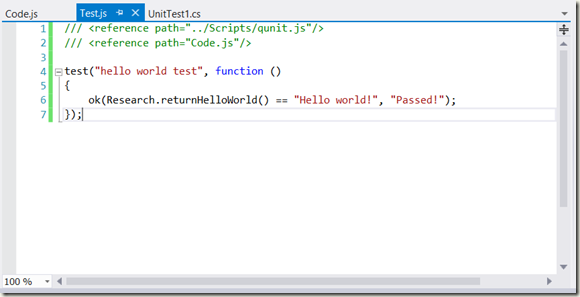 How to redirect the standard console output, to assert logmessages written by log4net. // Save original console output writer. // Redirect all Console messages to the StringWriter. // Log a debug message. // Get all messages written to the console. // Redirect back to original console output. 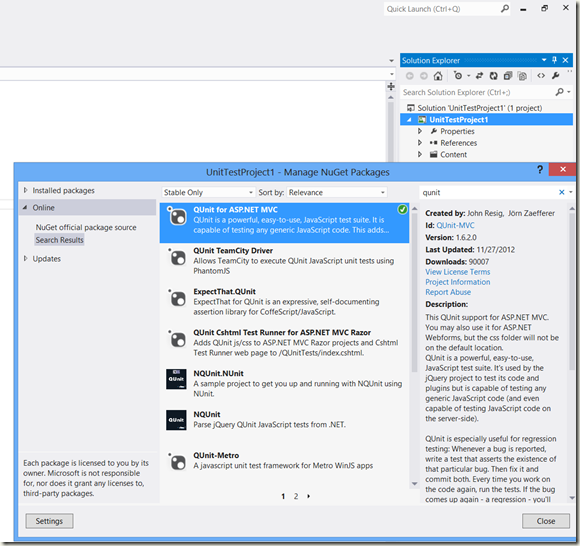 I used NuGet to add a reference to the latest log4net build. 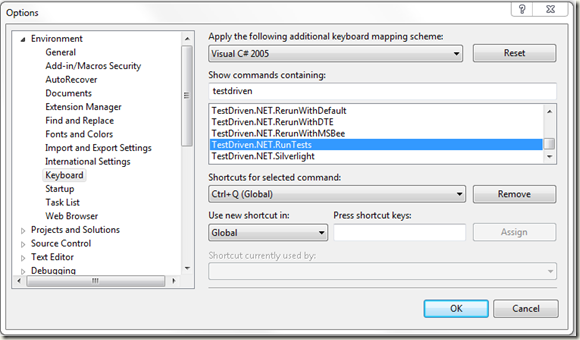 How to change the *.mdf and *.ldf location of an online Microsoft SQL Server LocalDb database in a Microsoft Visual Studio 2010 test. 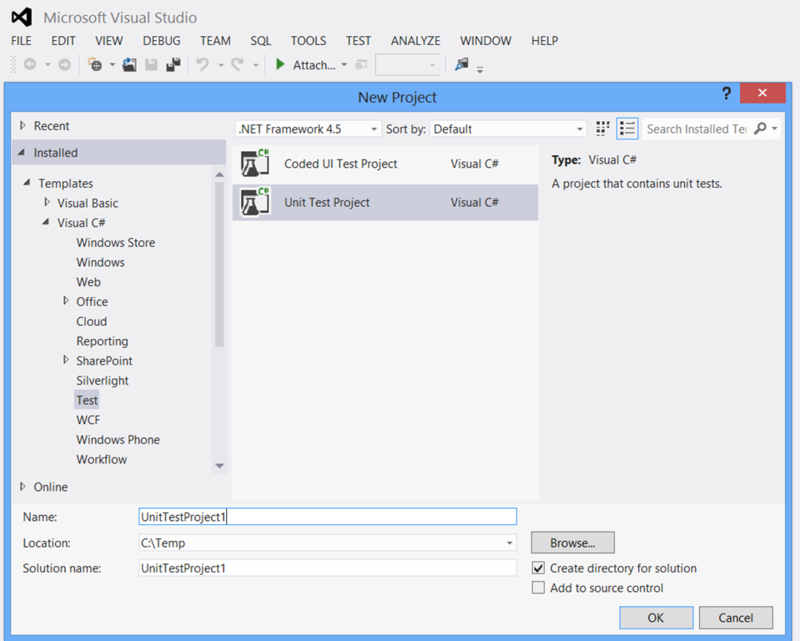 It is possible that a previous tests run did not cleanup it’s copy of the localdb database. 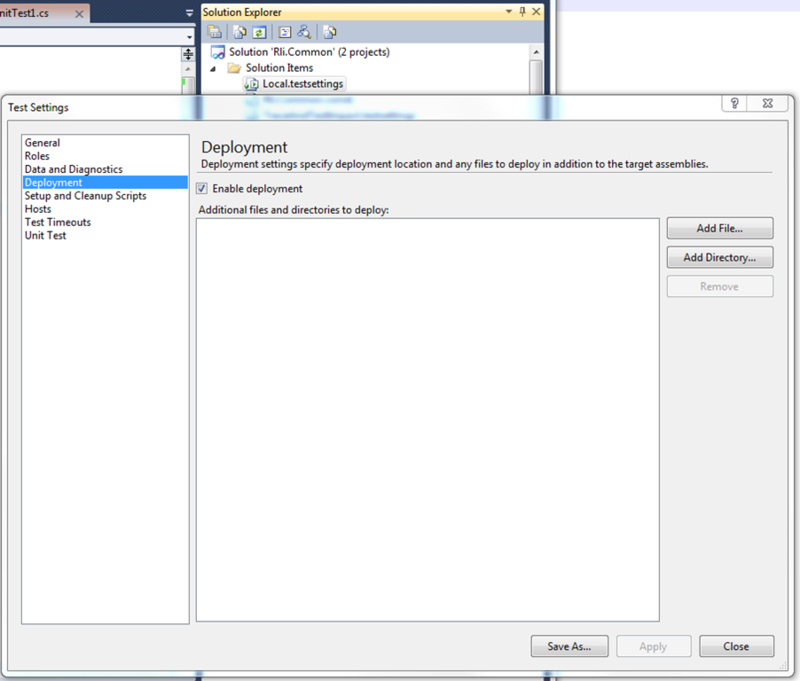 Now if you want to attach an new localdb database with the same name, the attach will fail. There are several options you have to fix this error. I decided to just "re-use" the existing database, just changing the *.mdf and *.ldf file location. 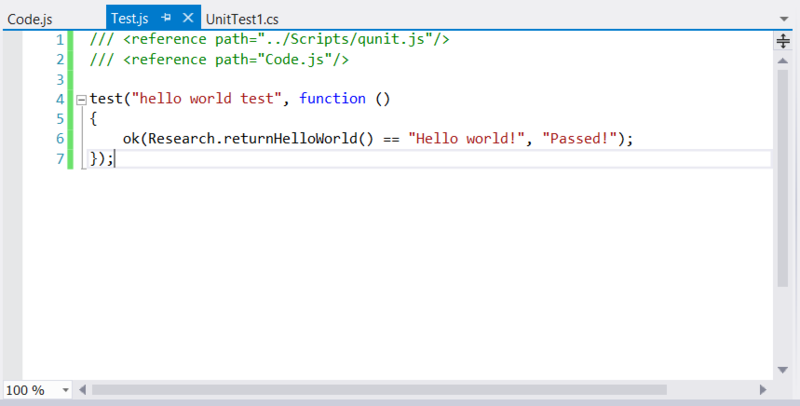 /// Tests in this class are only used to analyse and research code. 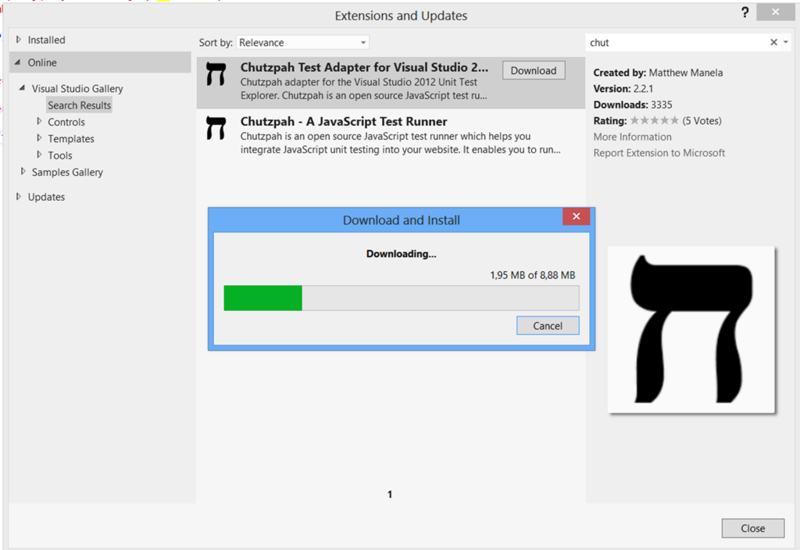 /// It is not intended to contain real integration tests. /// Changes the *.mdf and *.ldf file location for the given LocalDb database, when it exists. /// It expects the mdf file name to be in the format [DatabaseName.mdf]. /// It expects the ldf file name to be in the format [Databasename_log.ldf]. /// It expects the old mdf file name to be equal to the new mdf file name (only the file location will change). /// It expects the old ldf file name to be equal to the new ldf file name (only the file location will change). /// Gets the full physical mdf filepath, based on the supplied data soruce (Servername\Instancename) and database name. /// Databse found:     Returns the full physical mdf filepath. /// Databse not found: Returns null. /// Uses windows authentication to connect. /// This function does not take into account, the fact that a mdf file name can be different, then the [DatabaseName.mdf]. /// Modifies the *.mdf and *.ldf database file locations of an existing online database. /// - Uses windows authentication to connect. /// - Drops all existing database connections, by using [with rollback immediate] on the [set offline]. /// - Forces the database to use the new files, by using [set offline] and [set online]. /// - It expects the mdf file name to be in the format [DatabaseName.mdf]. /// - It expects the ldf file name to be in the format [Databasename_log.ldf]. /// - It expects the old mdf file name to be equal to the new mdf file name (only the file location will change). /// - It expects the old ldf file name to be equal to the new ldf file name (only the file location will change). 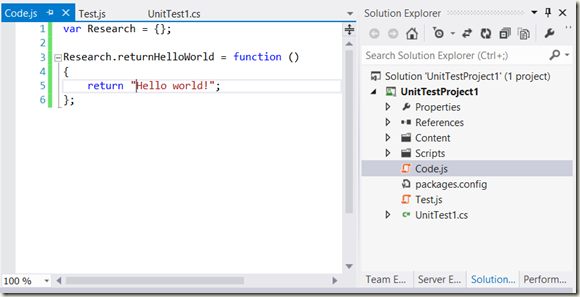 How to use content files from another project in a Visual Studio unit test, by using DeploymentItems. To access a file from another project in a Microsoft Visual Studio unit test, without specifying the absolute path, you can use DeploymentItems. 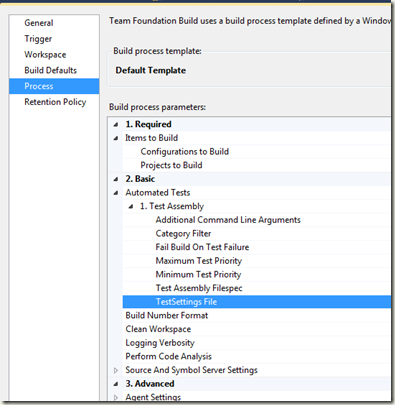 DeploymentItems are files that will be copied to the output folder of the test. 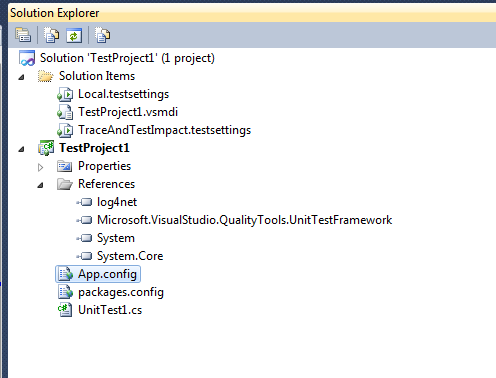 Microsoft Visual Studio tests are not run in the bin directory, but for each test a new directory is created, like: C:\Temp\Rli.Common\TestResults\rlisdonk_L084 2012-03-13 09_30_34\Out. 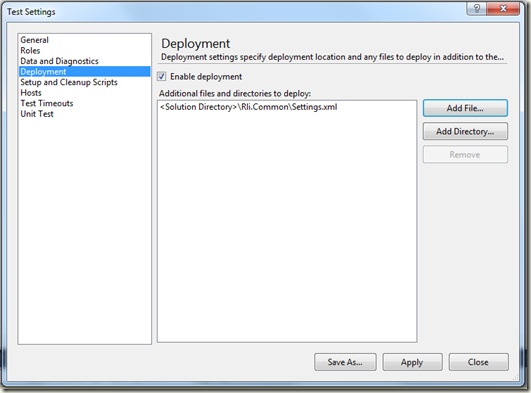 DeploymentItems will be copied to this directory. 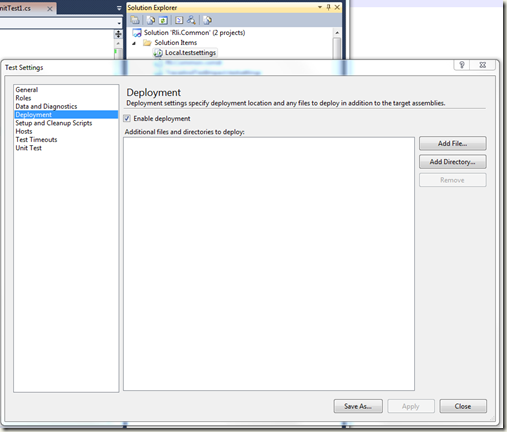 Double click on the Solution Item > Local.testsettings in the Solution Explorer > Click on Deployment > check the "Enable deployment" checkbox > Apply > Close. 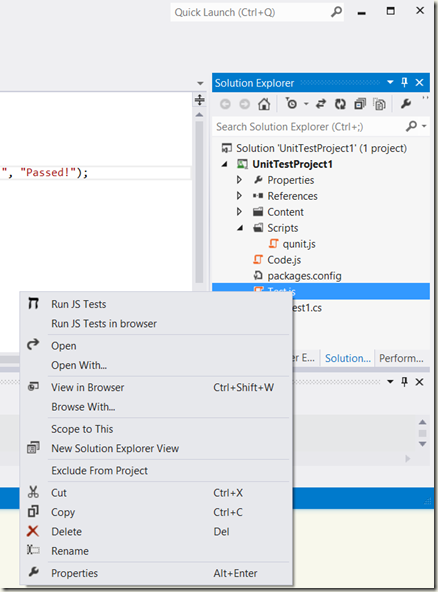 The file [Settings.xml] in the Rli.Common project, can now be accessed in the unit test "UnitTest1.TestMethod1" in the Microsoft Visual Studio test project "Rli.TestProject". 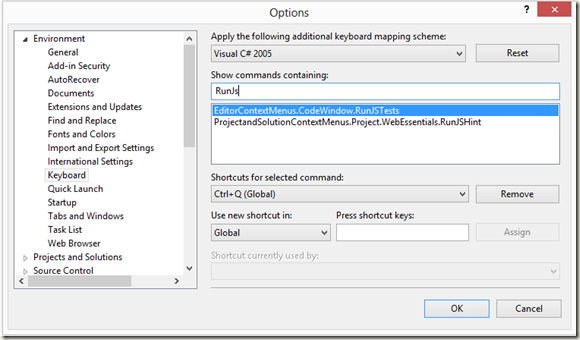 The relative path used in [DeploymentItem(@"Rli.Common\Settings.xml")] is relative to the Solution Folder! 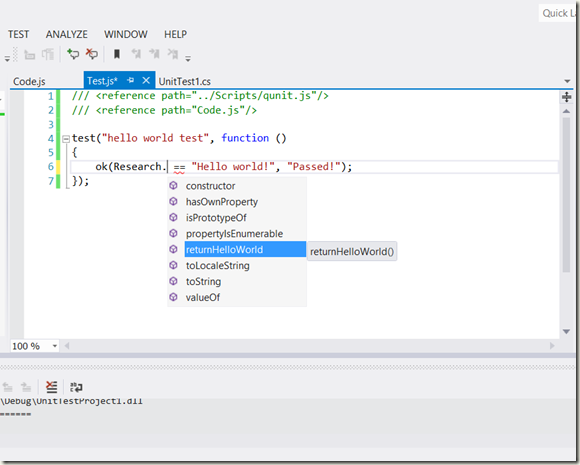 If you only want to use a content file from another project, the test project does not have to reference the other project. 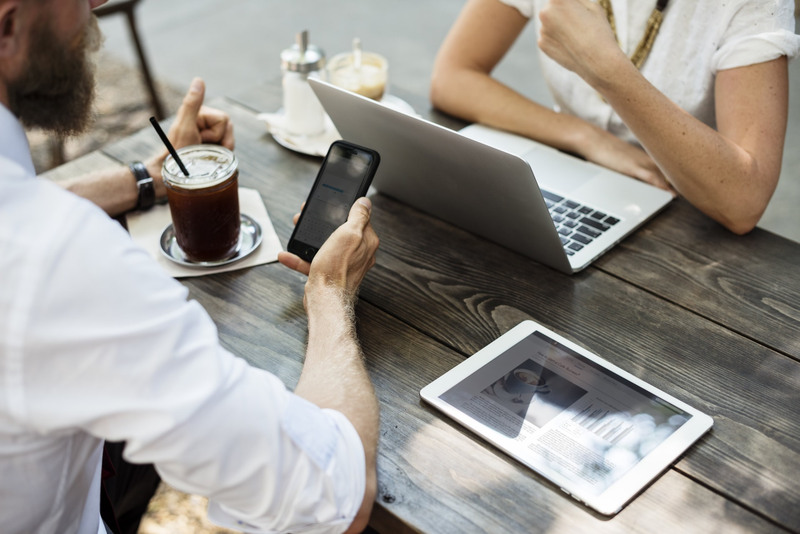 Adding files as linked content files (Project > Add Existing Item… > browse to the file, select it and click on Add As Link) and setting the file property "Copy to Output Directory" property to "Copy Always" will not work in this case. 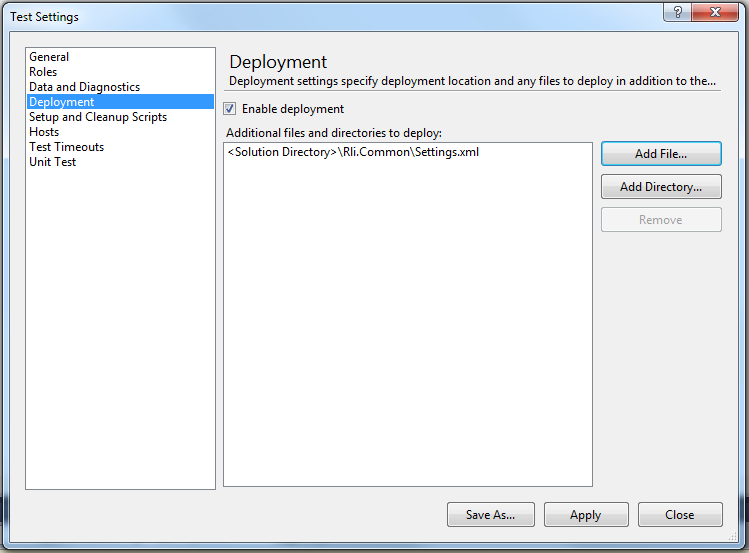 You will need to use DeploymentItems. 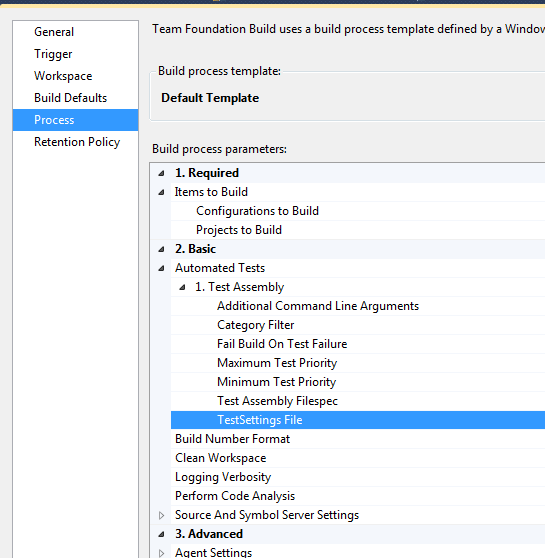 If you are using TFS with build templates, make sure the setting "TestSettings File" is set to a testsettings file that has Deployment files set to enabled. As testsettings file you can use, the Local.testsettings edited above. QUnit is the testing framework used to unit test the JQuery library. 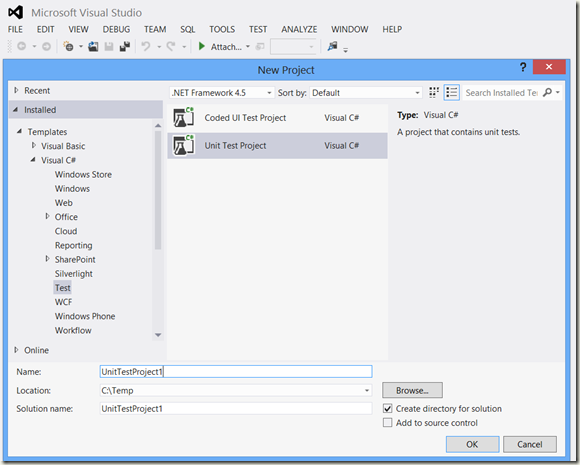 When you use a metadata class in Entity Framework the registration between the entity and the metadata class is not registered for all Microsoft Visual Studio Project types (the "test project class library" for example). I found the solution at: http://stackoverflow.com/questions/2657358/net-4-rtm-metadatatype-attribute-ignored-when-using-validator. It demonstrates registring all metadata classes in an assembly. /// Metadata classes are not always automatically registered, for example in a UnitTest classlibrary. /// This class can be used to register all metadata classes find in this assembly. /// Registration will only be done once. /// Register all metadata classes found in this assembly. 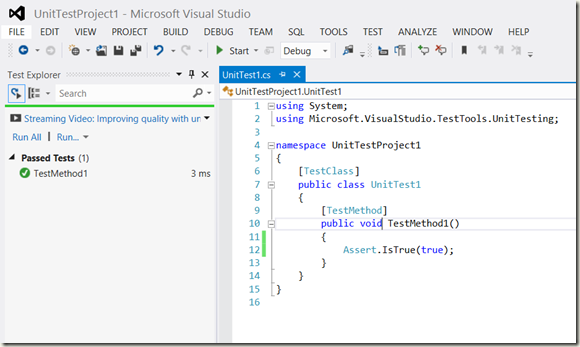 You can unit test the metadata attributes by using the following unit test class. // Validate only the zip code. // Validate the whole Customer entity.